architecture and 67 booths and stands. monkeys, snake charming, donkey & camel rides, trained goats, street performers and jugglers, and other exotic attractions. The exhibit included the International Restaurant, which seated 2,000 and the Alexandria Café, decorated in Egyptian splendor. The servers were all Egyptian-born. There you could dine on native cuisine or smoke an authentic waterpipe. 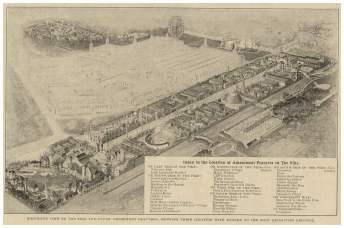 Algerian, Tunisian Village and Egyptian Temple exhibits were at 1893 Chicago World's Fair. add. 20 cents for guides and 75 cents- other attractions.